Diamonds are the hardest substance on earth. They are more brilliant than any other natural gem. Their sparkling fire, durability, and rarity make them the most prized of gems. The most popular diamonds are colorless. However, most diamonds have a light tint, usually yellowish or brownish. Perfectly clear diamonds are much more valuable than tinted diamonds. Very rarely, diamond occurs in deep hues of red, blue, and green. Such diamonds, known as "fancies", are extremely valuable. Diamonds are the most lustrous of true gems. They have a brilliant luster, and also exhibit dazzling color flashes known as "fire". This is caused by dispersion, where light enters the diamond and splits into the colors of the spectrum. The color of diamond is graded on an alphabetical scale ranging from D to Y. This scale measures the color saturation, ranging from absolutely colorless to deep yellow (or yellow-brown). D is bright white -- not a hint any other color. Y is deep yellow or yellow-brown. The letters in-between D and Y indicate the color, depending on the amount of yellow. The bar below depicts the letter and the color saturation it represents. (The bar is not limited to yellow; it may also be yellow-brown.) The letter Z in the color grade of a diamond indicates that it is a fancy, or deep-colored diamond. The cut, or facet of the diamond, is the manner in which the diamond is cut. The most preferred cut is the brilliant cut, a facet specially designed to bring out the most "fire" in the stone. Sometimes, this cut cannot be given, either because of flaws or cleavage habits. Other cuts are not as valuable as the brilliant cut. Much planning must be taken before cutting a diamond, as a slight error in the facet may greatly decrease the value of the stone. Clarity is graded on the size and discernability of the flaws and inclusions. Letters are assigned to a stone to label the quality of its clarity. The size of a diamond is measured in carats (abbreviated as "CT"). A carat is equivalent to 0.2 grams (about 0.007 ounces). Another weight measurement sometimes used for small for diamonds is the point measurement (abbreviated as "pt"). Each point is one/one hundredth of a carat. For example, a stone weighing 34 pt weighs .34 CT. Larger diamonds are worth more than proportionally smaller ones, meaning a 3 CT diamond surpasses the value of three 1 CT diamonds. Diamond is the most important gemstone in the industry. Roughly 80 percent of the gem trade is limited to diamonds alone. Diamonds of all different colors are faceted into various cuts; the colorless variety is most in demand. The other colors are less commonly worn in jewelry. Deep red, green, and blue diamonds are extremely rare and highly prized. Black, opaque diamond (bort) is occasionally faceted into a black gemstone with a metallic luster. Bort - dark colored, imperfectly crystallized, opaque diamond. May also refer to a fragment of a gem quality diamond. 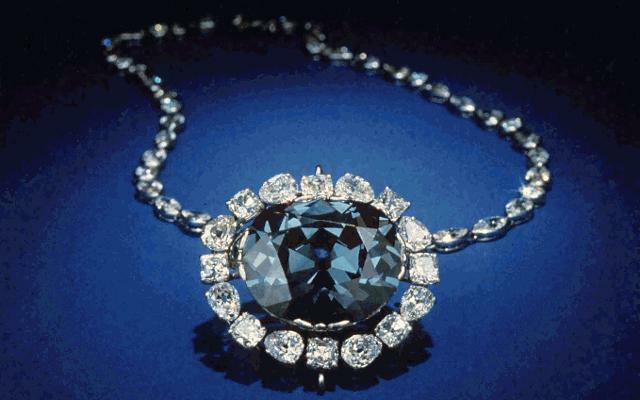 The 45.5-carat Hope Diamond as photographed when temporarily out of its setting in about 1988. Many gems resemble diamond. However, only few have a luster and fire similar to diamond. All of those, though, are MUCH softer than diamond. In fact, if the Mohs scale of hardness was a yard stick, and diamond was at 36", the next closet thing to it would still only be at about 1". It is not an exactly proportionate scale. Many synthetic materials are also made to resemble diamond, such as YAG, strontium titanate, cubic zirconia, synthetic rutile, and synthetic spinel. However, diamond is easily distinguished from all the others by immense hardness. Zircon, the only natural gem that comes close in fire and luster to diamond, is softer and has a strong double refraction. The diamond derives its name from the Greek word adamas, meaning unconquerable. The Diamond is the hardest substance on earth. Diamonds are formed under extreme heat and pressure deep within the earth's crust, and come to the surface through volcanic eruptions. Most diamonds found in nature are between one and three billion years old. 80% of the world's diamonds are not suitable for jewelry. Diamonds are the only gemstones composed of just one chemical element, carbon. Although crystal-clear, it is black when reduced to dust. In 1994, Pauline Willemse cut the world's smallest diamond. It was 50 times smaller than the head of a ballpoint pen. The largest diamond ever found was the Cullinan at 3,106 carats. Known also as the Star of Africa, it adorns the scepter of King Edward VII of England. The Tower of London is its current home. 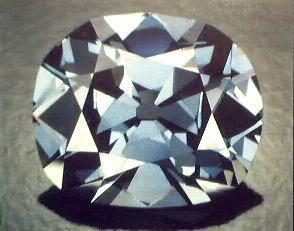 Most expensive diamond: The Wittlesbach Diamond at $24,311,190.00. It was bought in December 2008 and is 35.56 carats. The easiest way to spot the difference between a diamond and cubic zirconia is to weigh it. Cubic zirconia weigh 55% more than diamonds. A diamond's cut is critical to its final beauty. Diamonds can be completely consumed by fire at temperatures ranging from 1,400° to 1,607° F., depending on the hardness of the gem. The engagement diamond is worn on the third finger of the left hand, because the ancient Egyptians believed that the vein in that finger ran directly to the heart. The first recorded diamond engagement ring was given to Mary of Burgundy from Archduke Maximillian of Austria in 1477 as a betrothal gift. On May 13, 1888, using a pen encrusted with diamonds and emeralds, the Princess Imperial Regent Dona Isabel signed the decree ending slavery in Brazil. With a single stroke, she liberated 1,500,000 men, women and children, and brought freedom to the last slave-holding country in the western hemisphere. The 4 Cs , the characteristics by which a diamond's value is determined, were introduced in 1939. It is believed that a diamond: endows the wearer with courage and fortitude; brings victory and good fortune; wards off evil; protects against the plague; promotes constancy in a marriage.